The Arizona walk-in bath is a perfect selection where the look of a traditional bath is desired yet the convenience of door access is essential. This makes the Arizona walk in bath the natural choice when the bathroom needs to facilitate bathing for the varying needs of all the family. The Arizona is available with the door right or left handed (right handed model shown). Customise you bath with luxury options that include a 14 jet self-purging warm air spa, chromotherapy lighting, auto fill and Bluetooth sound system. 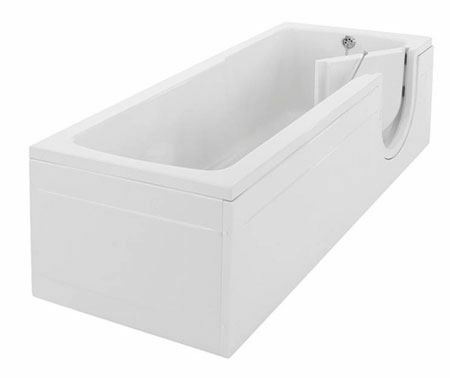 The Arizona walk in bath is available in industry standard lengths of 1500mm and 1700mm**. * 'Industry standard' refers to sizes commonly recognised within the industry. Baths are typically a little shorter. Please refer to specific info.